Visualizable ALT-TAB Replacement - Glance all open windows to switch to another ! WinGlance is a visualizable Alt-Tab replacement task switching utility. 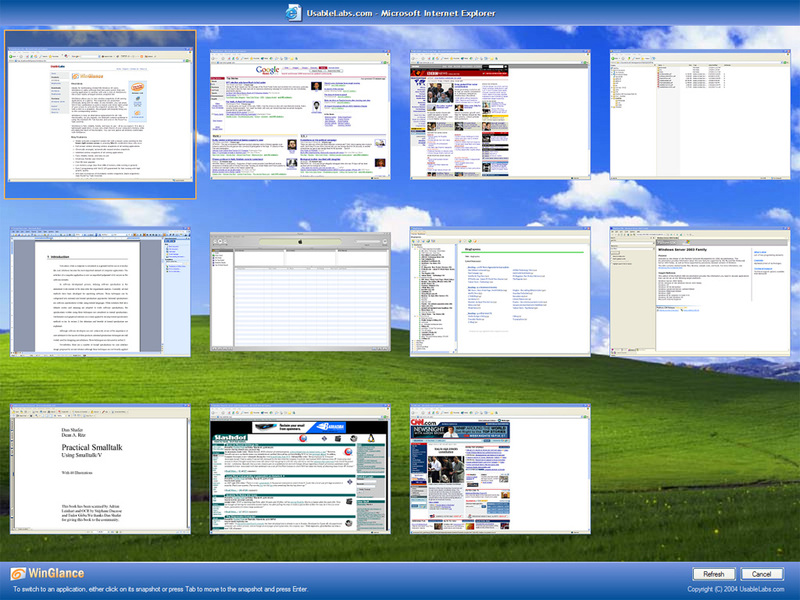 Ideally for multitasking-minded Windows XP users, it lets users switch from one open window to another, with only a click at the full-screen neatly-arranged window-snapshot list. At any moment, press Alt-Tab key combination or point a mouse over lower right corner of a screen to activate the overview window. A click on a snapshot will instantly bring you to the chosen window.WinGlance is truly an alternative replacement for Alt-Tab functionality. As you request, we eliminate common problems in using the standard Alt-Tab function and even in the PowerToy task-switcher. WinGlance is fast, reliable, handy, and easy to use - all as you expect. It is also a lightweight application; it uses very small chunk of your computer's memory while providing this much of functionality. You can now glance all windows comfortably with WinGlance.